Real estate developers and investors are increasingly using new and unconventional data sources to find hidden patterns—and harness them for profitable investments, reports US management and consulting firm McKinsey & Company. Resident surveys, mobile phone signal patterns, local restaurants reviews, and other macroeconomic and demographic indicators can help identify “hyperlocal” patterns—granular trends at the city block level rather than at the city level. Advanced analytics based on machine learning algorithms can stitch such data points together to predict more accurately areas with potential to appreciate in price. 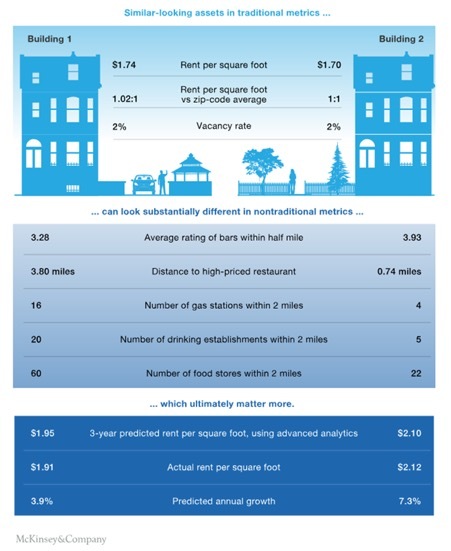 In one example, an application combining a large database of traditional and non-traditional data was used to forecast the three-year rent per square foot for multifamily buildings in Seattle. These machine-learning models predicted rents with an accuracy rate that exceeded 90 per cent. As expected, the variables related to traditional data sources—for instance, vacancy rates—correlated with future values. However, variables related to non-traditional data—such as proximity to highly rated restaurants or changes in the number of nearby apparel stores—explained 60 per cent of the changes in rent. In accounting for these non-traditional variables, buildings located in the same postcode can have widely disparate outcomes in terms of rental performance (See graphic below). Two buildings that are seemingly identical when evaluated by traditional metrics can ultimately experience very different growth trajectories. It is easy to imagine how this disparity at the individual building level, when applied across a series of investments, can drive dramatic results at the portfolio level. Big data can also help developers who want to identify underused but high-value parcels zoned for development. Advanced analytics can quickly identify areas of focus, then assess the potential of a given parcel with a predictive lens. The developer can thus quickly access hyperlocal community data, paired with land use data and market forecasts, and select the most relevant neighbourhoods and type of buildings for development. The developer can also optimise development timing, mix of property uses, and price segmentation to maximise value. Consider, too, an asset manager who wants to expand and optimise a portfolio of multifamily buildings. Machine learning algorithms can rapidly combine macro and hyperlocal forecasts to prioritise cities and neighbourhoods with the highest demand for multifamily housing. This allows the asset manager to identify buildings in areas that are undervalued but rising in popularity. When it comes to these classic real estate conundrums, advanced analytics can rapidly yield powerful input that informs new hypotheses, challenges conventional intuition, and sifts through the noise to identify what matters most. In another example, a railway company in the U.S. analysed its condition-monitoring data to develop a list of prioritised annual-maintenance tasks. This helped the company to save more than 30,000 person-hours a year and allowed them to redirect $20 million of annual engine-overhaul spending to capital-replacement investments. 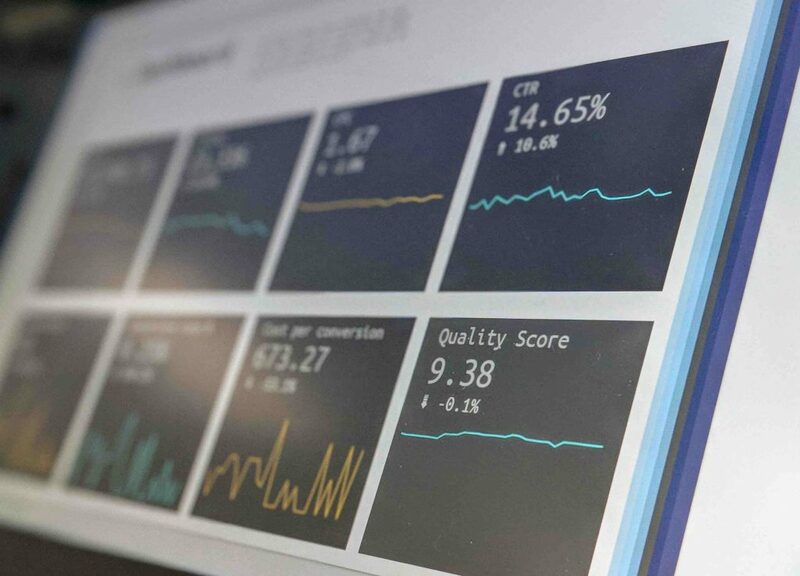 Granted, building advanced analytics into a portfolio is no straightforward task. Collecting enough data to build accurate algorithms takes time, and manually scrubbing data for use in analytics can be costly. To face this challenge head-on, companies might begin by employing analytics in executing their most critical strategic imperatives; pursuing data-cleansing efforts based first on the most valuable use cases; and establishing clear processes for data governance, interpretation, and decision making. Ultimately, data analytics should have its own strategic direction with long-term roles and goals beyond just a few pilot projects and use cases. These solutions will evolve at a rapid clip—progress in artificial intelligence is frequently exponential rather than linear—and companies must consider them as realistic supplements to their current underwriting, portfolio review, and research processes. If companies fail to act now, they run the risk of adapting too late.